G.G. Hatheway describes how British-Canadian and American companies entered upon a nineteenth century contest in transatlantic crossings. 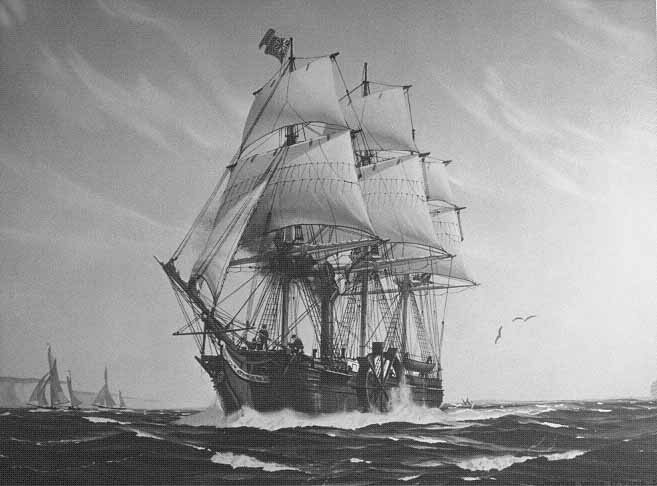 Her majesty’s 10-gun brig, Tyrian, twenty days out of Halifax, bound for Bristol, rocked gently on the swells of the North Atlantic. She was becalmed; most of her passengers lounged on deck watching the western horizon where a dirty, black smudge was growing steadily larger. Soon, at the base of the smudge, they could discern the paddle-steamer Sirius, which was bound on the return journey from New York to Liverpool. The Sirius came alongside the sailing vessel and stopped. Two of Tyrian’s passengers, the Hon. Joseph Howe and Sir Thomas Chandler Haliburton, both of Halifax, saw the Royal Mails transferred from the sailing vessel to the steamer. Later these two were rowed across to the Sirius and went aboard for a glass of champagne with her captain, Lieutenant Richard Roberts, R.N. Upon their return to the Tyrian they watched as the steamer’s paddle-wheels began to churn and the Sirius was soon out of sight to the East. This scene took place in April 1838.